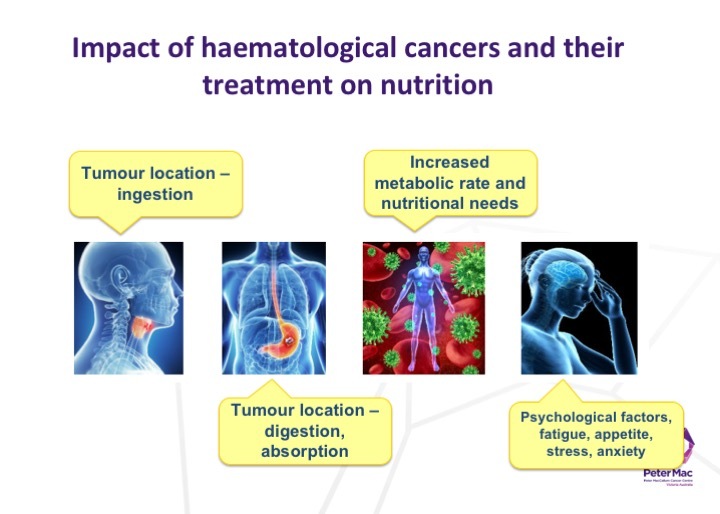 Lauren begins her presentation with an explanation of haematological malignancies, treatment options and the impact of haem cancers and treatment on nutrition. 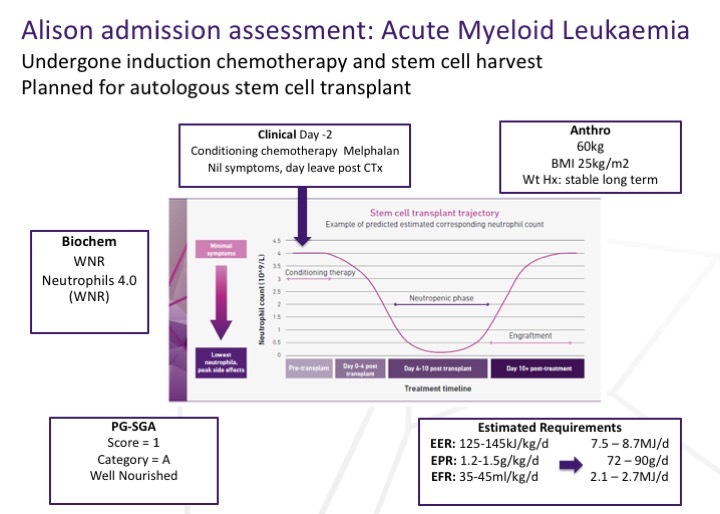 Her case study is Alison, a 46-year-old woman diagnosed with acute myeloid leukaemia. She has induction chemotherapy and stem cell harvest and is planned for autologous stem cell transplant. Lauren Atkins is an Accredited Practising Dietitian with a particular interest in oncology and haematology. She graduated with a Bachelor or Nutrition and Dietetics at Monash University with the student prize for Highest Academic Achievement and DAA prize for Excellence in Professional Practice. Lauren went on to complete a Graduate Certificate in Paediatric Nutrition and Dietetics. She has experience in both adult and paediatric haematology and oncology, having spent her career working at Peter MacCallum Cancer Centre, The Royal Children’s Hospitals in Melbourne and privately as Co-Director of her business, OnCore Nutrition. She has vast experience in using good nutrition to help prevent, manage and overcome cancer, from diagnosis through to survivorship and palliation and has been invited to present much of her research at national and international conferences. She has a particular interest in education and is the lead clinician in the development and evaluation of the Dept of Health and Human Services funded Malnutrition in Cancer eLearning Program for multidisciplinary health professionals. Lauren also provides oncology nutrition education for Deakin, Monash, LaTrobe and Victoria Universities in Melbourne.